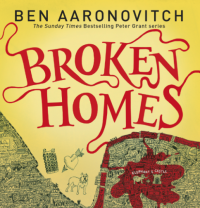 The fourth of Ben Aaronovitch's PC Peter Grant novels, Broken Homes, brings the policemen from the supernatural branch of the Met, The Folly, to South London. I felt like this book was following me around actually, as most of it is set in the Elephant and Castle, which isn't far from me, and which I was often going through on the bus while I was reading. But then when I went to the Barbican a couple of times last week, the action briefly moved there as well. This time the action centres on a tower block at the Elephant and Castle, an unusually-shaped building which to be honest I thought it took the characters a bit too long to figure out must have been built to harness some occult power. It's another fun book although it feels very much like a transitional one rather than ever really kicking off its narrative. Without spoilering, certain events at the end confirm the impression that the book is largely setup for things that will happen in later installments of the series. Twitaceous Era 40: I embrace change!